Situated in the historical district, this hotel is within 9 mi (15 km) of Val di Merse, University of Siena, and Siena Cathedral. Piazza del Campo and Porta Romana are also within 9 mi (15 km). Monteroni D'Arbia Ponte A Tressa Station is 14 minutes by foot and Monteroni D'Arbia Station is 26 minutes. Situated in Rapolano Terme, this farm stay is 0.5 mi (0.8 km) from Museo dell'Antica Grancia e dell'Olio and within 3 mi (5 km) of San Giovanni Terme Rapolano and Pieve Romanica di San Vittore Church. Terme Antica Querciolaia and Saltalbero Adventure Park are also within 6 mi (10 km). 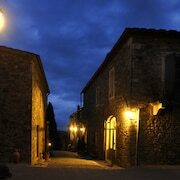 Hotels in Crete Senesi start at $56 per night. Prices and availability subject to change. Additional terms may apply. 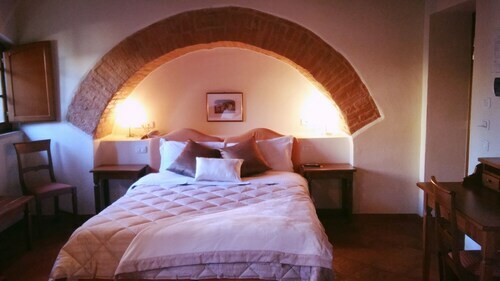 If you're not sure how to begin planning your Siena escape, relax, because you'll find a huge selection of comfortable hotel and apartment possibilities in Crete Senesi. An impressive 26 hotel establishments can easily be found inside a 6-mile (10-kilometer) radius from Crete Senesi's downtown precinct. Find out about many places to stay located within a drive from Crete Senesi's urban core, such as the Tenuta la Campana and Palazzo Monaci. Travelers on a budget will be happy to find that there is a good selection of lower-priced places to stay in Crete Senesi. 7 miles (12 kilometers) from Crete Senesi's heart is where you'll find the Laticastelli. The Le Valline Country Resort is only 9 miles (15 kilometers) away. The Agriturismo San Giorgio and the Agritourism Tenuta Armaiolo are two more budget places that are worth checking out. The Castello Banfi - Il Borgo is 18 miles (28 kilometers) from the middle of Crete Senesi. Or, alternatively, the Rosewood Castiglion del Bosco can be found approximately 11 miles (17 kilometers) away. The Castel Monastero and also the Castello di Velona SPA Resort & Winery are two more Travelocity-listed accommodation options worth looking into in Crete Senesi. Researching so you can venture further afield? Tuscany is home to many options. 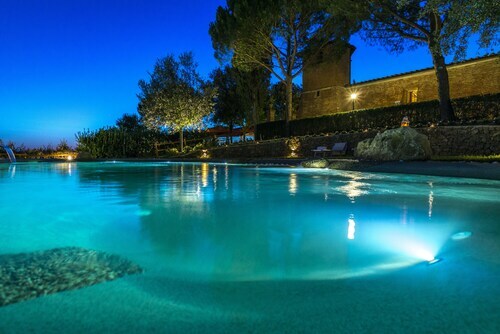 Tuscany proudly boasts rural landscapes, beaches, coastal plains and rivers. Frequented visitor attractions are ruins. Energetic visitors may also get into snowboarding in the area. Siena Historical Center is 12 miles (19 kilometers) to the northwest of Crete Senesi and is where you'll find Duomo Nuovo and Cappella di Piazza. Some Siena Historical Center places to stay include the Grand Hotel Continental Siena – Starhotels Collezione and Hotel Certosa Di Maggiano. 25 miles (39 kilometers) northwest of Crete Senesi, you can also stay at Val d'Elsa, home to the Tenuta Di Mensanello and Torraccia di Chiusi. The Archeological and Collegiate Church Museum and Torre Rognosa are some of the more frequented places to get to know while in Val d'Elsa. Peretola Airport is a primary gateway for air travel, and is 45 miles (70 kilometers) away from Crete Senesi's downtown. Travelocity-listed places to stay nearby are The St. Regis Florence and The Westin Excelsior, Florence.